On this Escape, visit the must-see landmarks and experience the culture of Britain without the crowds—and even better—without the high-season prices. It’s the perfect, concise Britain escorted tour that offers you the unforgettable sights of this great land! Have your camera ready to capture all the magnificent experiences as you travel from London to Edinburgh. History buffs will delight in seeing mysterious, prehistoric Stonehenge (just imagine how those stones got there! ); the Roman Baths in Bath, constructed around 70 AD and today one of the best-preserved Roman remains in the world; Liverpool, once a great Victorian city and Atlantic seaport, and renowned birthplace of the Beatles; and Edinburgh, home to many Scottish monarchs, including Queen Margaret, who died here in 1093. 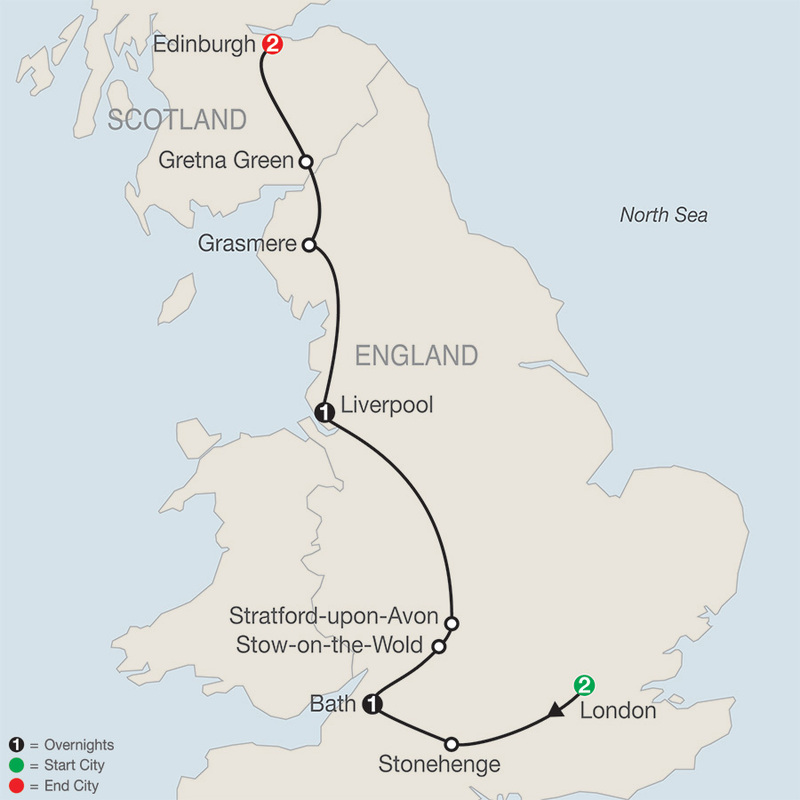 DAY 5 LIVERPOOL–GRASMERE–GRETNA GREEN, SCOTLAND–EDINBURGH. Hotels listed may occasionaly be substituted with alternate hotels of equivalent standard. Inside visits and special features are shown in the description, including admission charges when applicable. Learn about Standard Included Features. The stylish 4 star Novotel Liverpool is located in the city center. Book this Liverpool hotel for close proximity to the Liverpool Echo Arena, the Albert Dock and Liverpool One shopping center. Each of the 209 chic rooms has wireless internet and satellite TV. Our Liverpool hotel is located at Kings Waterfront in the iconic docks, right opposite the Echo Arena and Convention Centre. The hotel is just a ten minute walk from Liverpool Central train station, and the Albert Dock is just next door. A fine 3 star Edinburgh hotel, ideally located in the city center's popular Princes Street. Mercure Edinburgh City Princes Street Hotel has great views of Edinburgh Castle. The 158 stylish rooms all have internet access and satellite TV. Princes Dining Room and Bar are open for breakfast, lunch and dinner, as well as for light snacks and drinks. The grand, classically designed Carlton has an excellent central location just off the Royal Mile and is equidistant between the castle and Holyrood Palace. With 189 spacious air-cooling rooms, the hotel is an ideal base from which to explore the city. It offers the elegant Bridge Restaurant, a cocktail bar, a fitness suite with Techno gym equipment, swimming pool, sauna, steam room spa, and a squash court. Skip the lines and get special treatment at the must-see attractions. We’ve done the work to find just the right hotels in just the right locations. Take your heads out of the guidebook and let expert guides make every destination fascinating. Leave the navigating to us – and just sit back and enjoy the ride.